This walk was about snatching the one fine day amongst a maelstrom of recent grim weather. Storm Doris struck yesterday and today was a lull before the wind and rain returned. 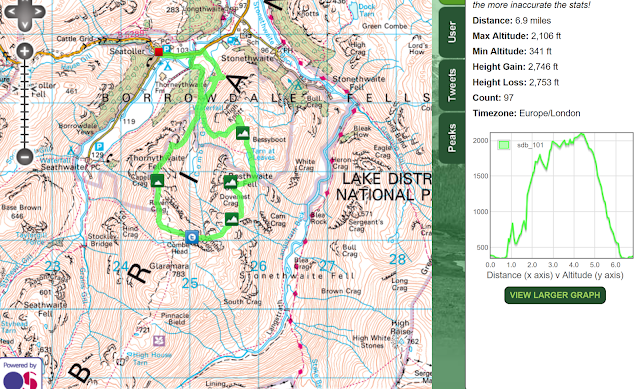 A quick perusal of the 'outstanding Wainwrights' revealed a few stragglers that needed ticking off. Fleetwith Pike and Rosthwaite Fell were good candidates and the latter was closer. I wanted to be done and dusted my mid afternoon when the grim weather was forecast to return, so it was a 5am alarm for a 7:30 start. I parked at Seatoller and headed up the path by Comb Gill, pausing by the waterfalls to take in the impressive scenery. The path steepens as it climbs up towards Bessyboot (Rosthwaite Fell) and the views open up over towards the Seathwaite Fells which were all capped with snow. From Bessyboot it's a pathless meander down to 'Tarn at Leaves' and then steeply up onto Rosthwaite Cam with a real scramble to get up onto the summit of the Cam itself. 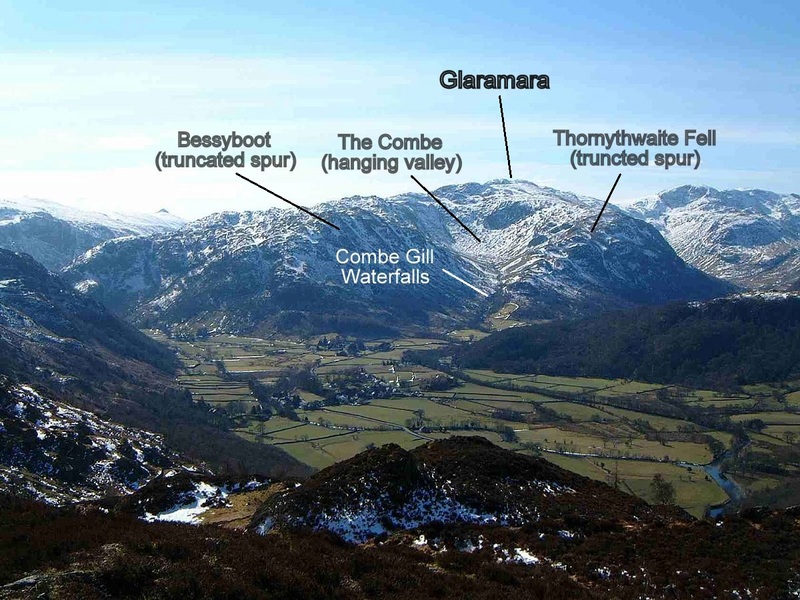 For any budding Geologists 'The Combe' is one of the Lake Districts finest examples of a glacial hanging valley. It looks like a huge spoon has scooped a bowl shaped depression out of the side of Glaramara but it is of course formed by glacial erosion. 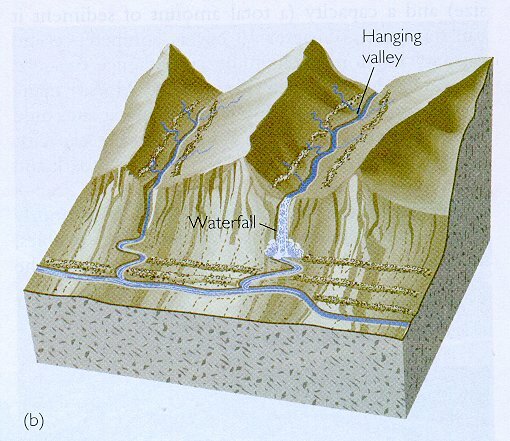 Hanging valleys are formed when a smaller valley (which erodes more slowly) meets a larger glaciated valley (which erodes more quickly). The hanging valley is found perpendicular to and above the main valley and often forms spectacular waterfalls as streams from the overhanging valley spill into the main valley below. The waterfalls of Comb Gill are great example of this as they tumble downwards to feed into the River Derwent in the Borrowdale valley. Steeps crags (truncated spurs) form the sides of hanging valleys and are perfectly illustrated here by Bessyboot and Thornythwaite Fell respectively. My walk was essentially a horseshoe route circumventing The Combe. It's a great route to appreciate the geology of the region.